D.I.Y. Doctor Who Pullover Tutorial on GadChick! 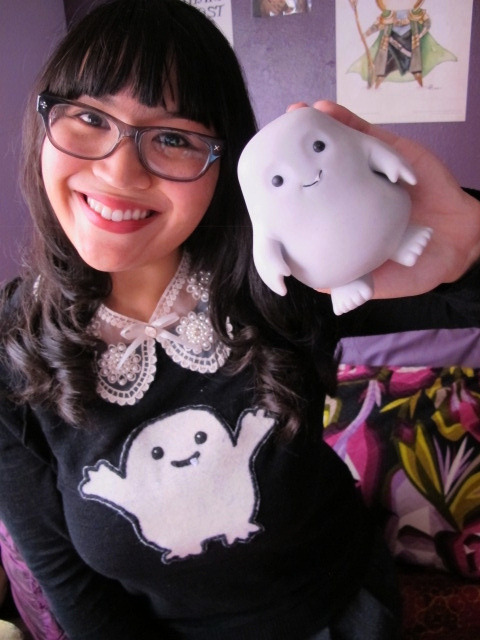 In case you’re wondering what an Adipose is, it’s an Intergalactic creature that’s basically composed of fat. That sounds super gross, but they’re soooo cute! They appear in the Doctor Who episode “Partners in Crime,” which is super adorbz BTW and is one of my favorite DW episodes because Donna Noble (played by Catherine Tate) RULES. Once again, the tutorial can be found here. And if you happen to make a sweater for yourself, send me a picture! I’d love to see what you all come up with!!! Everything in your shop is adorable! You’re very welcome. And Rosemary is brilliant! Love the tutorial. So easy and soo cute. I also love the jumper paired with your lovely lace collar. Very pretty. This is so cute! Donna is my favourite of all the Dr Who companions, and she really does shine in that episode. “I’m waving at fat”,,priceless!